"Fabulous" is the best way to describe this stunningly upgraded home! Enter the front door and have your eyes glaze over the brand new hardwood floors covering the floors in the spacious living room, dining room, and hallway of the open concept of this first floor! Walking forward you'll notice the entire kitchen has been newly renovated with granite counter tops, porcelain tiled flooring and state of the art stainless appliances - all included in the sale! Further ahead is the step down family room, with vaulted ceiling, porcelain flooring as well, and French doors opening to the attached deck out back. Grill and watch the activity of guests playing football or horseshoes in the huge vinyl fenced in back yard! Spacious bedroom with new carpeting let you rest comfortably at night. The Master BR has 2 walk in closets and a stunning M. Bath with double sink, granite counters, & large walk in shower. For the "cherry" on the top of the cake, check out the gorgeously finished basement, complete with sitting room and elec. decorator fireplace, separate game room with granite counter top bar, plus a bathroom already roughed out for you to install your personal fixtures. The 2 car, attached garage, has insulated, sheet rocked walls, automatic opener, and plenty of storage. The entire house has a security system (Comcast) for all doors and windows for those times you take that long vacation you so deserve! Can be monitored remotely, too. 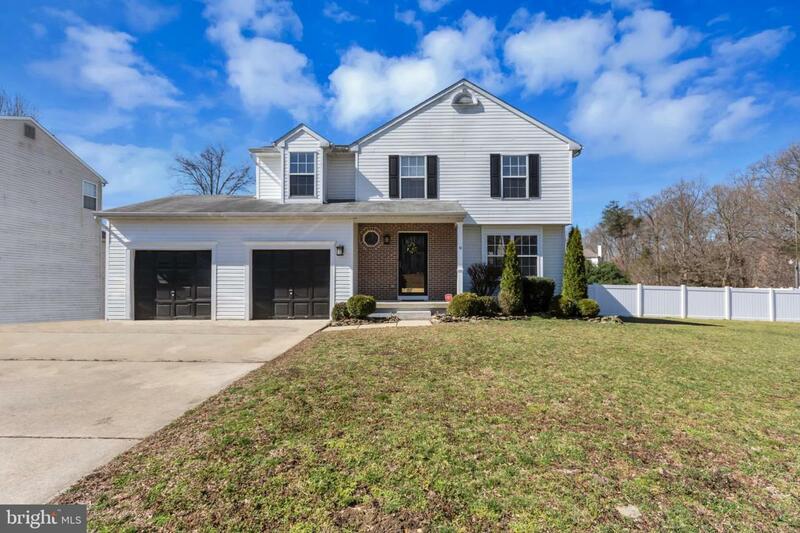 Located so close to Phila., South Jersey Shore points, & the ever popular Gloucester Outlets, the school system is a popular favorite among many home owners in the area. Come! Make this home yours! You will be glad you did! Inclusions Dishwasher Microwave Garb. Disp. Ref.